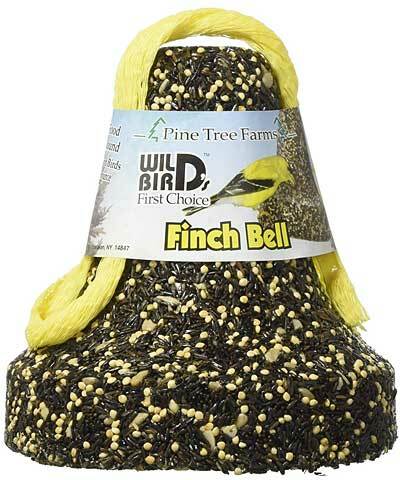 Celebrate finches and offer them a fun feeding station with this Pine Tree Farms Finch Seed Bell with Net. The charming and familiar shape of this unit adds a whimsical look to your garden, while offering food to select songbirds. The blend of thistle seed and millet invites finches and goldfinches to dine, and an included, yellow mesh bag surrounds the unit for easy hanging. Place a few of these bells throughout your yard for creating different feeding zones, allowing several birds to dine easily. The seed blend provides several nutrients to your feathered friends, assisting them in maintaining their high metabolisms, and the gelatin binding helps the bell retain its shape. Offer a fun food to finches with this Finch Seed Bell with Net. Made in the USA.